Is black bathroom tapware here to stay? 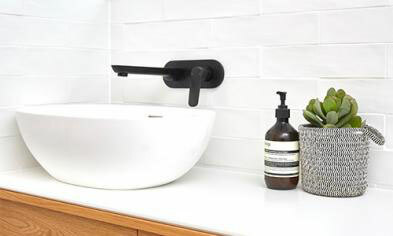 Black is the new black, especially in bathroom tapware. It’s a look that is undoubtably striking and effortlessly chic, but is black tapware here to stay? It’s a big question in the bathroom space right now. Will black tapware date? Will black tapware fade? We spoke to the senior designers from Porter Davis, Randall Pye and Keith Fuller, to get some answers and delve a little deeper into the design debate. Randall: I think it’s here to stay, but perhaps not with the same prominence as we have seen lately. Black bathroom tapware is undoubtedly a very cool highlight at the moment, but I don’t think it’s for everyone or every bathroom. You have to consider if it will be a time marker on your bathroom, when the next design trend hits. Keith: Yes. Black tapware can work well with any style of bathroom and is still growing in popularity – and fast! It’s perhaps not for everyone, but you can’t deny it has got staying power. Would you choose black bathroom tapware over chrome in an everyday bathroom? Randall: Personally, I wouldn’t use it in my own home, but I would use it for a development project where I’m aiming for immediate impact in the current market. That said, I still consider chrome to be the perfect all-rounder. To me chrome is to tapware what white is to wall colour; it’s timeless and beautiful. Keith: Chrome has been the standard for years, but black can’t be compared to other trend-inspired finishes which have come and gone. So, yes, I would choose black over chrome in the right bathroom. 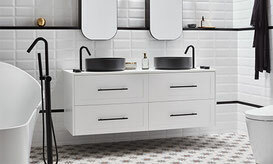 Black has an advantage over other fad finishes because you can now buy matching hardware and accessories, and the theme can then be carried right throughout the bathroom. What are the pros and cons of black tapware? Randall: Black ticks the boxes for a cool, sleek look. It also offers some playful flexibility with different colour palettes and schemes. But the consideration with any trend-based look is, it could timestamp a home when the trend moves on. Fingerprints are also quite noticeable on black tapware. 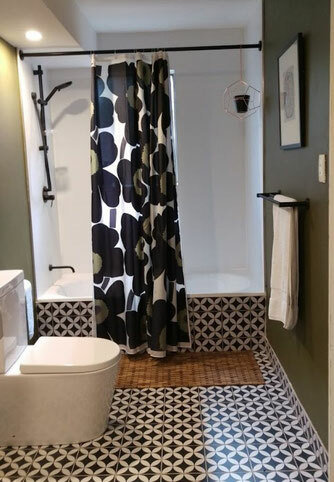 Keith: By choosing black bathroom tapware you will get that instant wow-factor! It’s perfect for that little bit of detail that pops and says ‘I’m on trend’. The only negative is it may feel like an old fad later, but it can be easily swapped out. Randall isn’t entirely sold on the longevity of black bathroom tapware, but still acknowledges its place in a contemporary home. For Keith, there’s a lot to love about black tapware, and if does get a bit tired in years to come, as he says, it’s fairly easy to update! Is black bathroom tapware here to stay? It’s still up for debate. Perhaps you’ll be swayed by the latest range – check them out from Reece. Contact Us For A Free Quote And Renovation Design By Email.